Vacuum your rugs regularly to remove dry soil. Gritty soil can be tracked indoors and scratch and cut fibers. The longer the soil remains in the rug, the more damage it will cause, so the rugs should be vacuumed at least once a month. Make one vacuum pass on each end across the width of the rug to avoid fringe damage. Spills should be blotted with absorbent cloth or paper towels immediately. Remember that pet “accidents” can damage the dyes in natural fiber rugs in a very short time, if not removed immediately. Please be aware of the dangers with T.V. ad and grocery store spotters. 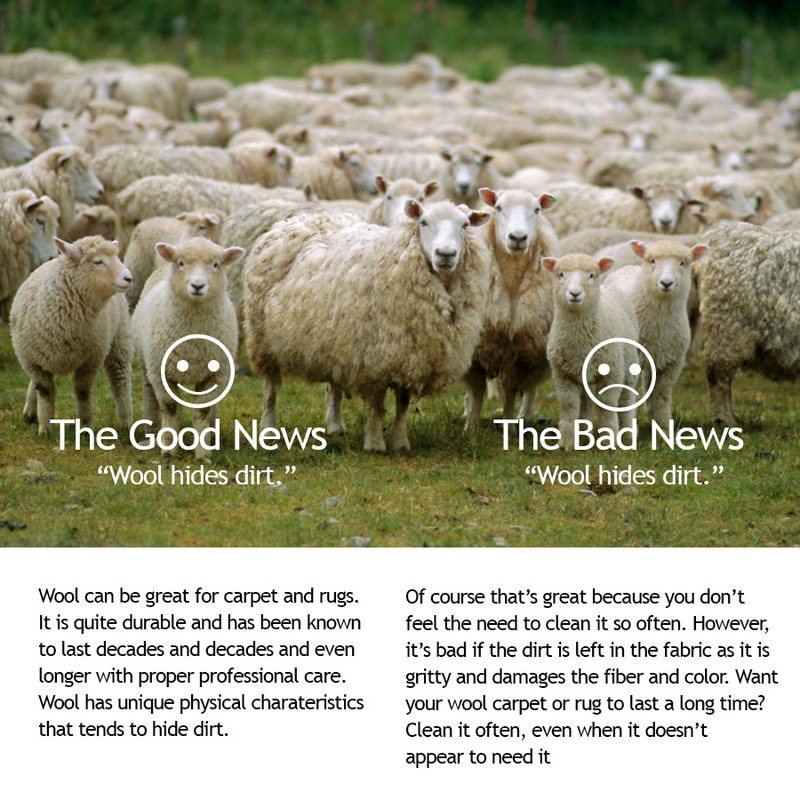 These products are not “Wool Safe” approved and may bleach you natural fiber rugs and carpets. Dish-washing liquids and powders often cause re-soiling and are also best avoided. Work the spot toward the center and avoid scrubbing in a circular motion as this will cause texture distortion and fuzzing. Do not use powdered carpet fresheners. The Powder is difficult to remove with cleaning. To prevent uneven wear and light fading; we suggest you turn the rug at least once a year. This can also prevent texture changes in the rug. In addition to above, we recommend the use of a rug pad. A good quality pad will add years to the life of a rug, help prevent slippage and create more comfort under your feet. In addition to visible dry soil; atmospheric oily soil can settle on the rug and change the color to look “Yellowish” or “Grayish” this is why we recommend for rugs in high traffic areas to be professionally cleaned every 6 to 12 months. Proper cleaning by a Trained Professional at this frequency will extend the life of your quality rug. First, soak up the excess liquid spill by blotting with an absorbent cloth or extracting with a wet vac or Bissell type spot machine. DO NOT brush or rub the stain. Use the right spotter (see spotting agents). Don’t use too much spotter. Using an inappropriate chemical may ruin your rug. Pre-test the spotter. Rinse area with diluted vinegar and water solution. Pour a small amount. Blot the area dry until most of the moisture is absorbed or extract the excess moisture with a wet vac. Use the techniques on this website at your own risk. Be aware that rugs can easily be ruined. Pre-test each solution in an inconspicuous area before using. If you are not confident about these techniques, call a professional. This guide is made up of over 32 years of rug cleaning experience. I hope this guide helps you in being able to help your fine rugs last a lifetime. Wool is very durable and cleans very well if cleaned often. This is much in part because it is a natural fiber. Spots and spills must be removed immediately. Since wool is a natural fiber, it may stain easily. If you cannot remove the stain, call a professional. As well, wool rugs should be cleaned on a regular basis BEFORE the appear soiled. The lesson here is with frequent, regular cleaning, wool carpets are easy to maintain but if allowed to accumulate soil, they are indeed difficult to clean. Avoid bleaches and strong chemicals. Bleach will actually dissolve wool. Silk is a rare fiber that adds a unique texture and appearance to some rugs. The same rules apply with silk as wool. Extra caution should be taken with silk. Silk should not be allowed to get wet. Shrinkage and bleeding is very likely. Cotton rugs respond similar to wool. Sisal, grass, and hemp rugs should not get wet. Avoid liquid spills as well as liquid spotting agents. Absorbent cloths to gently blot stains. White vinegar diluted at 1 part vinegar to 4 parts water. Rubbing alcohol applied to a cloth. Use the cloth to blot up oils.